Spring is here which means it's time for a round of "how many hours can I spend unsuccessfully online shopping?" This time of year I always find myself wishing I had a closet full of soft dresses and billowy shirts to throw on for every day of the week. Alas I do not because I'm picky a.f. and have difficult / too-expensive-for-my-budget taste. I did however, find a few pieces in line with my overall spring aesthetic. Think overalls, peasant blouses, and pastels (in addition to the white sneakers and denim hot pants). 1. One example of the billowy shirts I crave when the weather gets warm. I think they look best with skinny jeans or hot pants. Although, if you can get away with heeled mules, a flared jean could be great too. 2. I chose this shirt specifically with a pair of overalls in mind. I've been looking for the perfect Victorian / high-neck / frilly shirt for this. 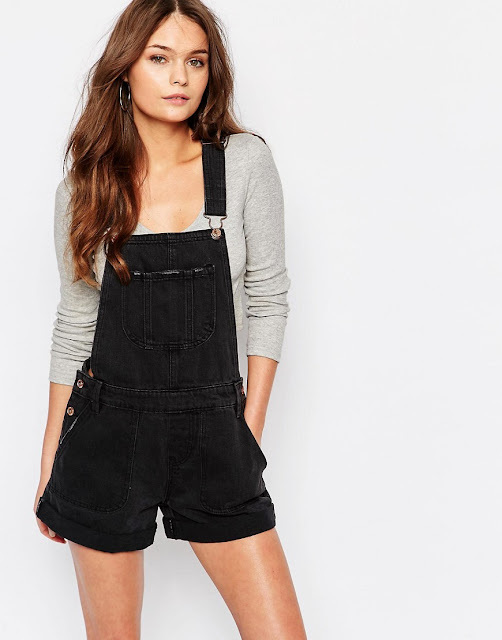 Paired with shorts overalls (shorts overalls?) it's the perfect outfit for a warm-with-chilly-air spring day. Paired with regular overalls and you're go to go for a rainy day. 3. 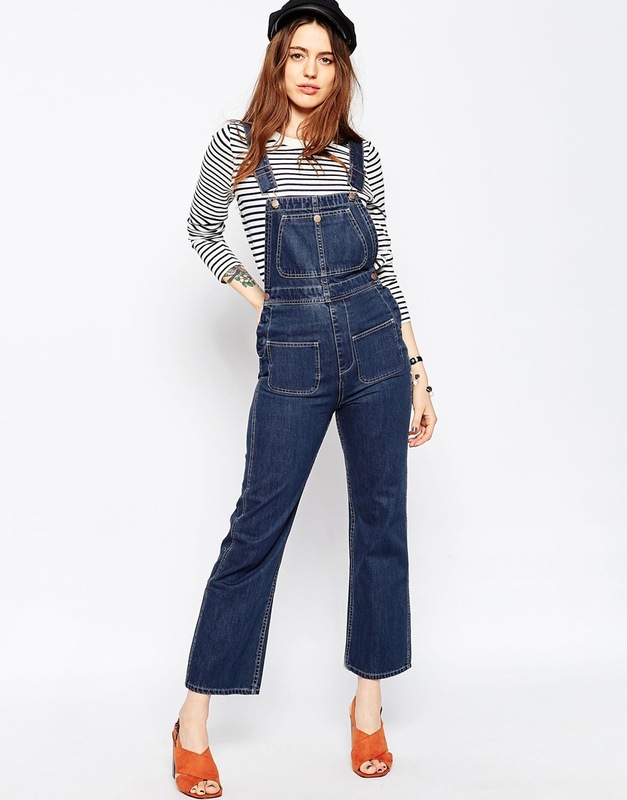 These are the aforementioned overalls I want. I'm currently waiting for my size to come back in stock. 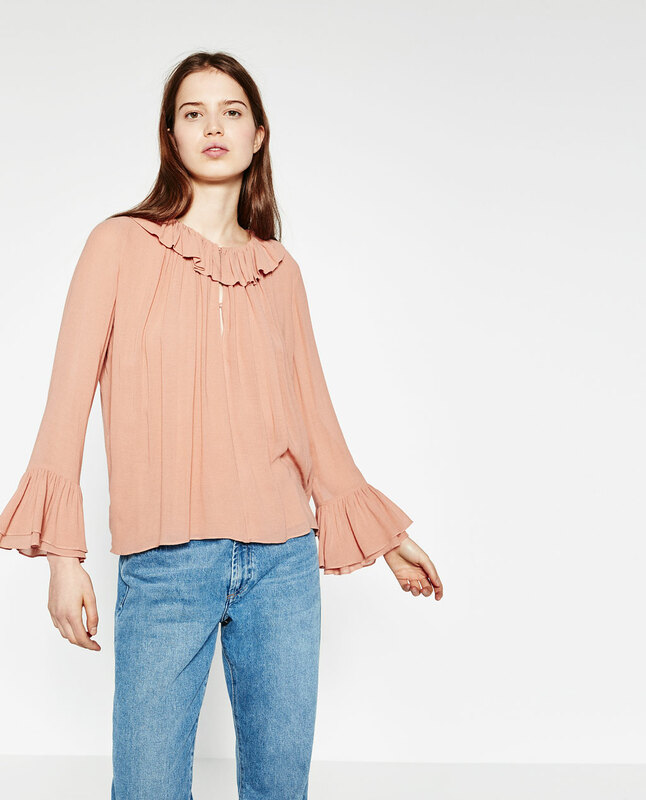 So many tops you could pair this with: breton striped long sleeves, breton striped sweaters, Victorian shirts, pajama tops, t-shirts, turtlenecks, the list goes on. 4. I've also been contemplating wide-legged overalls. Previously they've been a bit too 70s for me, but this pair looks updated and quite cool. I'm a little nervous about the price and the way they'd look with a flat shoe because they look so perfect with those mules! Mid-heel mules and and kitten heels are the dream...but that's a post for another day. 5. This dress reminds me a little of purple Topshop Unique dress that Alexa Chung wore during London Fashion week last year. She paired it with black pointed flats which I think is great for the fall, add tights and it's a winter outfit. However, I'd pair with it sandals or white sneakers for an easy spring / summer look. 6. Finally, a staple for season after season is a classic trench. I bought one from Banana Republic about two years ago and I will probably have it for years to come. It's great to keep one on hand for overcast days when you're not sure it'll rain. They're light enough to wear even when it's not rainy, and they add a classic touch to any outfit. I think for sure the most difficult thing to find to go will of these wonderful new outfit ideas is shoes. Although in theory, there are tons of possibilities, in practice comfort is key. One day when I don't have to trek across five blocks and a large university campus everyday, I might wear shoes that are more fun. I think to be honest, you can't go wrong with a pair of white sneakers or a good ol' pair of loafers.